Vermont Consciousness and Contact…To be Continued. Vermont Consciousness and Contact will be Continued in October. You are invited! 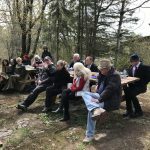 Before the memory of our recent Vermont Consciousness and Contact fades, I want to share with you my highlights, because, you are invited to the next gathering scheduled for October 12,13 and 14 at the Vershire Riding Academy. Driving from Boston’s Logan Airport north into Vermont, I felt my body shift as 6 lane urban highways became 2 lanes, bordered by tree-lined streams in the first bloom of bright green spring. It was a journey into the welcoming womb of mother earth–Vermont-style. Slowly, we pulled into rutted dirt road that led to the Vershire Riding Academy– a working farm of horse fields, barns, dining hall and dorms. If like me, you spent many summers at camp or in rural areas, Vershire Riding Academy was halcyon. 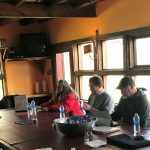 As the attendees gathered in the dining hall, I caught my first glimpse of Mia Feroleto, who organized Vermont Consciousness and Contact. Nine years ago, Steve Bassett connected Mia and me. Since then, Mia and I logged hundreds of hours on email and phone. Never meeting in person. Until Consciousness and Contact. Needless to say, our hugs were endless. There is an effect that happens through the Alchemy of Vershire when blending contactees, animals and homegrown food on a land anchored by crystalline energies. We all resonated with the endless high vibrations that reflected in relationships formed and information shared. And the food. We dined on endless homemade cheeses, yogurt, ice cream, fresh herbs, greens, pastas, eggs and healthy well water–a vegetarian movable feast. Our hearts, souls and bodies were nurtured on long rustic picnic-style dining hall tables. The ancient presence of the Druids, who are one with the land, continues in Vershire Riding Academy’s “Druid’s Field” where their horses quietly roamed. Trees, horses, rocks, grass and contactees formed fractals as we moved in the fields. Can you imagine a night gathering where you lie in Druid’s Field draped in stars and beings? We did. And you will in September. There is a phenomenon that occurs when contactees gather. When Exoconscious Humans meet one another. It is as if a crack opens and the hot lava of long suppressed ET Experiences pour forth. We talk. We share. We relate. LOTS. I felt as though I was living through a volcanic eruption of release. We downloaded one another. Again and Again. Have you felt this with fellow experiencers? We not only communicated with one another, but via animal communicator, David Louis, we communicated with our animals, those in our homes and those who have passed over. David gently nudged us into communion with all of the animal beings of Vershire. We looked in the mirror of the animal beings and saw ourselves. Affinity. Marilyn Gewacke shared her Albany, NY awakening consciousness retreats, Jennifer Stein presented her crop circles research that merged us deeper into the earth, Alan Steinfeld made us laugh and feel tender as he shared his consciousness journey, Linda Moulton Howe examined a Reagan memo about beings identified by our government, and I shared what it means to be an Exoconscious Human and the vision of our community who are co-creating a vital, healthy, peaceful reality with extraterrestrials.